Kristoffer Friis Bøegh is a PhD-researcher at Aarhus University. He conducted fieldwork on Crucian, an English-based creole language spoken on St. Croix in the US Virgin Islands. He has published on creoles and African languages and is currently analysing his field data. We interviewed him in Aarhus about his experiences as a fieldworker. Could you briefly summarise your descriptive project and the fieldwork you conducted? 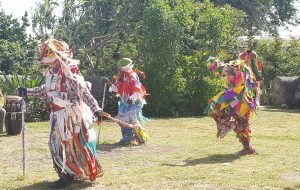 I went to St. Croix, which is one of the Virgin Islands in the Caribbean, to study the local English-lexifier creole language, locally known as Crucian. My project is part of an ongoing effort in creole language studies to increase empirical documentation of creoles, especially lesser known varieties. Before I went I studied archival material and historical and demographic data, as well as the available linguistic data. The aim of my fieldwork was to collect new data in order to be able to write a description of the history and grammar of Crucian. Where did you get the idea for this particular project? I became interested in the Virgin Islands’ linguistic history during my studies. I was into creole languages and one of my teachers at the time handed me a book on the language history of the Virgin Islands and the former Dutch creole that was used there. These islands also used to be Danish colony, they were called the Danish West Indies then, but they have been under many flags throughout history. So for someone interested in contact linguistics, this area forms such an interesting linguistic patchwork. So I started to read everything that had been published on language contact in the Virgin Islands, and starting writing to people to learn what would be a good topic to investigate further. And at some point I landed at the variety of English creole spoken on St. Croix, which I found out was the least well-described variety used throughout the Virgins group. So I decided that that would be the language I would work on. What kind of data did you collect? I basically collected two kinds of data. I first started elicitation, where I basically asked for translations and did various kinds of exercises. I also collected spoken texts, which is basically spontaneous speech of various types that I then translated and transcribed. These spoken texts could be narratives, oral history, people having a conversation and so, it’s the language in use basically. I also tried to gather data from as many different speakers as I could, from various different social settings, to have as much variety as possible. As for elicitation, I used various techniques and stimuli. I used for instance a modified version of Östen Dahl’s classic Tense-Modality-Aspect Questionnaire, which had previously been used to study other English-based creoles. And I think it’s important to emphasise that spoken texts and elicitation go together very well, and that you get the best results from getting both. So for instance, what you find in spoken texts gives you a good idea of how the language is actually used, but there might be some grammatical marker that only rarely shows up in spontaneous speech, which you might never find if you solely relied on spontaneous speech. So that’s where the questionnaire-type data came in really handy. And before I went I also collected written texts and audio recordings from earlier periods, because I wanted to be able to take a diachronic perspective. What kind of preparations did you make? Basically I had all the materials that I had collected, and I studied those as extensively as I could. I then built a linguistic corpus based on that, and as I was doing that I identified areas that I was interested in. So relevant questions arose while I was preparing, and I entered the field knowing more or less what I wanted to learn more about. As to practical matters, when you go somewhere for an extended period of time, you of course have to arrange a trip, get a place to stay, you have to arrange transportation, you have to get equipment such as a good recorder and microphone. But what was most important in my case was to establish contacts. If you make sure people know you before you arrive and know what you want to do, this saves you a lot of time finding people, being introduced into the community, and so on. Things can move very slowly in the field. So I collected phone numbers, e-mail addresses, arranged for people to meet with me as soon as I got there, which worked out well. I was fortunate to have the support of a number of local researchers and culture bearers, some of whose contributions to making my fieldwork experience a good one I think it’s hard to overstate. I am very grateful to them. Did you feel like you had all the data you needed when you left the field? And when you got back home and started working on your data? That’s difficult to answer. It wasn’t like an experiment-type investigation where you have a single questionnaire and you know you need a hundred participants which you then at some point actually have, and where you then say ‘okay, that’s all’. Fieldwork is to a large extent exploratory, and in this kind of research it is hard to know when you have enough data. And like Jeroen also said, it’s not so much about the quantity as it is about the quality in many cases. But basically I felt good about what I was bringing home, which is a good sign. What were some of the challenges in the field? 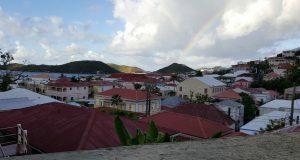 In creole-speaking communities, the creole is often reserved for in-group interaction, and Crucian exists in a continuum relation with English. So when talking with outsiders, people tend to switch to a more standard variety. Virgin Islanders tend to have a good command of several varieties and registers of speech and switch easily, so it was important to minimise these ‘outsider effects’. William Labov called this the Observer’s Paradox; as a linguist you want to observe the real thing and for a speaker to use their language in a natural way, but your very presence makes things unnatural for them. J: this actually also happened to Angela Kluge, who wrote a grammar of Papuan Malay. That’s a variety of Indonesian spoken alongside Standard Indonesian which speakers are also fluent in, and when she asked questions about Papuan Malay speakers would just switch to Standard Indonesian, because that’s what you speak to outsiders there. So she solely relied on analysing spontaneous speech there I think. It’s similar to that, yes. Although once I got to know people better after we’d had a few chats, they would usually become a bit more comfortable using the creole with me. But it really could take some warming up to achieve that. Of course, it all depended on who I was working with. What was the nicest thing about fieldwork? I want to mention two things. Firstly, I met a lot of inspiring and very kind people. From the eighty-year-old Calypsonian who drove around with me on the island and helped me get in touch with locals you would otherwise never find, to the man who turned out to be a natural linguist, who had always thought a lot about language in the Virgin Islands, and whom I learned a lot from. And there were of course many, many others. Secondly, it was great to get some hands-on experience with fieldwork myself, outside of a classroom setting, and then also getting the results. If there were anything you wish you knew before you went on fieldwork, what would it be? There are many things. But one thing I don’t think you would find in any fieldwork guide is that it’s sometimes easy to over-prepare. So you might enter a session with someone that you’ve spent a long time preparing, and it turns out they would actually much rather tell stories than to go through paradigms, or the other way around. You have to be able to deal with that. Another thing is that’s actually not so bad to ‘waste’ a day once in a while, in the sense of not recording anyone or not filling out a questionnaire. This is because it’s essential to get to know the people you’re working with and to establish a good relation with them. So even if the first session with a consultant doesn’t result in a ton of data, you’re actually laying the foundation for future interaction. How many hours did you work on average you think? That varied a lot actually, that is, in terms of hours spent working with speakers. On some days I did an hour or two of recording, sometimes a whole afternoon, and on some days I didn’t get to collect new data at all but had to spend my time making preparations or working with existing materials. Sometimes you come home with hours worth of good material, and sometimes it was perhaps a nice day but you didn’t get that much out of it in terms of data. That’s just part of it. Do you have any intentions of doing fieldwork again? If so, will it be something similar? If not, why? I’m up for it. It would be great to go back to St. Croix, which I hope to get to do, and it would also be exciting to do a totally different kind of project. It would be interesting to see how the experiences I got from this project hold up when I do a completely different kind of project. But the basic answer is definitely yes, I would go again. Any words for aspiring fieldworkers? My experience is that it’s really rewarding. Like anything, it has its ups and downs, but I feel I got a lot out of it. And if you’re interested in getting experience with fieldwork, I would like to stress that you don’t have to travel to the Caribbean or Africa or New Guinea to do it. You can do fieldwork in your own country as well. The next time you stand in the checkout line in a Danish supermarket, you could try pointing to the checkout divider, which I suspect many people don’t actually have a word they use for, and then ask those in line with you what they would call it and note down their replies. Of course, that’s just an example of something you could go do today that’s also a kind of fieldwork. J: There’s this band called The Fall, and they’ve had so many different line-ups throughout the years that the only permanent member is the founder Mark E. Smith. Someone once asked him ‘What is The Fall exactly?’, and he answered ‘if it’s me and your granny on bongos, it’s The Fall’. And it’s basically the same with fieldwork. If it’s you, the linguist, and any type of question about a language, it’s fieldwork. I think that’s a really good point. Of course there are more endangered languages in, say, New Guinea than you find close to home and one might say those are more urgent projects, but the point is to just be curious about language. 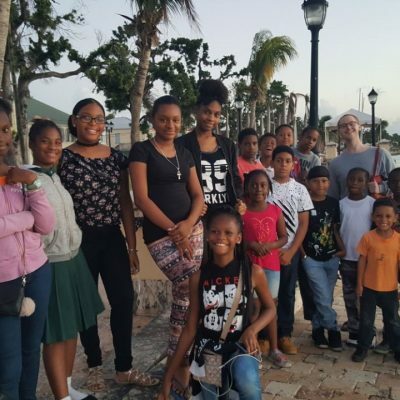 Cover photo: Kristoffer with St. Patrick’s Youth Ministry in Frederiksted, St. Croix. Photo by Nereida Washington, gratefully acknowledged, with thanks also to Gerard Doward.